Pharmaceutical transport is big business in North-Rhine Westphalia, where DUS airport is situated. The annual export and import of pharma goods from this area totals almost ten billion euros. This represents more than 10 percent of total German pharmaceutical export and 12 percent of imports. The split between pharma export and import is almost 50%-50%. Regretfully, not all travels by air. But the tendency towards air cargo is rising. This is the main reason that DUS Airport Cargo under the management of Gerton Hulsman convinced their peers to invest in what is today called DUS Pharma Center (DPC). The new facility which is ideally located between the aircraft stands and the present cargo terminal was opened earlier this year. Its total size is 800 sqm of which 500 sqm is available for temperature controlled goods storage. Two dedicated truck docks are available for quick loading and offloading of these types of cargo and a “Fast Track” ramp service has also been introduced. The facility is split into three sections consisting of 23 separate cool cells. These are 21 cells each 13 sqm in size along with a further 2 cells of 26 sqm each. All three sections which vary in storage size can keep temperatures individually controlled between +2C and +25 C.
Training plays a very important role Thomas Schuermann explained to his audience. Not just how to handle such goods, but also local regulatory conditions and international standards as well as emergency response training and the handling of “active and passive” ULDs are part of the intensive training programme his staff have to go through. DUS Airport Cargo will apply for CEIV Pharma Certification under the IATA Pharmaceutical Training Course. The procedures for the application are being put into place and it is hoped that certification will be in the very near future. The DUS Airport Cargo cooling facilities, although not as large as those in AUH, are seen to be just as effective. This seems to be one of the reasons why Etihad Cargo uses DUS Cargo’s services at the airport. In our view, a very effective joint presentation. Transporting pharmaceuticals and other temperature sensitive goods now requires usage of refined cool containers. Katharina Wuensche, Business Development Director of UK based va-Q-tec actually had one of their latest containers brought to the workshop and gave those attending an on-the-spot look at what they can offer. va-Q-tec‘s containers are also in use with Etihad Cargo and Julian Sutch told CargoForwarder Global that he is very happy with the quick and flexible service offered by Katherina and her team. Admittedly, there are quite a few companies on the market offering containers for the transport of pharma and other sensitive goods. 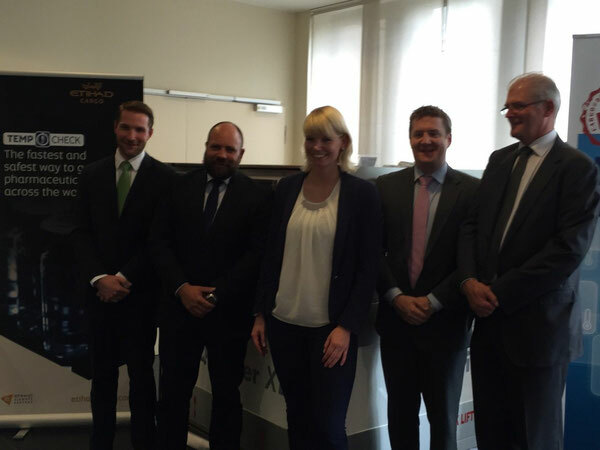 Therefore, it was interesting to get a hands on explanation of what can be offered and the needs of the shipping industry. va-Q-tec also rents out their containers to carriers and shippers at what Mrs Wuensche stated are attractive rates. This boils down to the fact that mostly only the actual “flown usage time” is billed to the client. 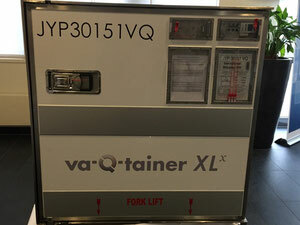 The container on view in Duesseldorf was the va-Q-tainer XL. Each can load up to two Euro pallets or bulk loading. The containers log internal and external temperatures during transport and can hold selected temperatures for up to five days during summer or winter with temperatures ranging between -50C to +25C. The company offers a worldwide network of stations where they state that rental and delivery times are very fast.